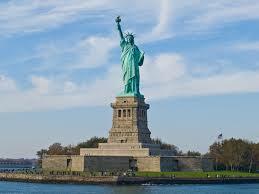 The Statue of Liberty was evacuated Friday after reports of a suspicious package. The NYPD bomb squad was called in. The Statue of Liberty and Liberty Island were both been evacuated Friday afternoon after parks police received a report of a suspicious package, law enforcement sources tell NBC 4 New York. Tourists were ferried off of the island after parks police patrolling with dogs near a visitors’ locker area picked up the scent of a suspicious package shortly before 1 p.m, sources say. The NYPD’s bomb squad was called to the scene, along with EMS workers. A security sweep of the island is also being conducted.